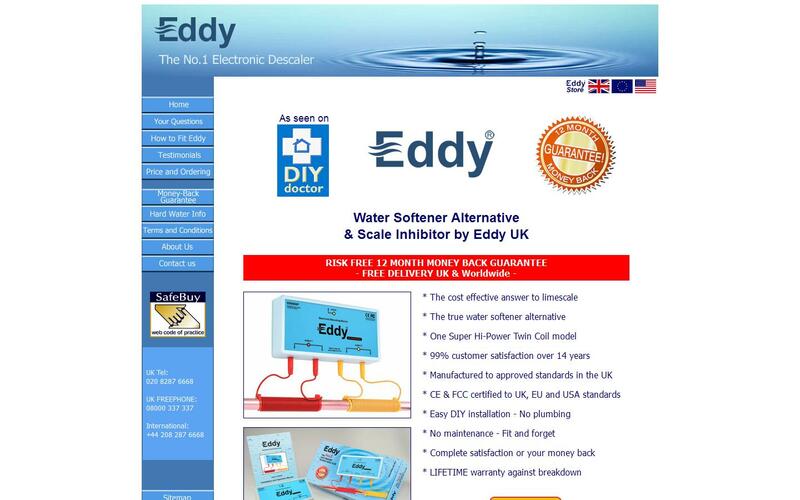 Electronic water descaler specialists, Eddy UK, manufacture a low cost, eco friendly alternative to water softening. Using the very latest in technology, the electronic descaler can remove limescale on your entire house or building, including your combi boiler, removing the build of limescale which hard water normally entails. The electronic descalers ensures that showers, taps, appliances and pipes can be rid of limescale making them run more efficiently and healthier for the user. An Eddy descaler is manufactured with one super hi-power twin coil which can be installed on a copper, plastic or iron pipe to help treat hard water and help rid the problems you have with the build up of limescale. The hard water descaler is manufactured to ISO9001 quality standards in the UK and certified to CE & FCC in the UK, EU and USA. To date we have had 99% customer satisfaction in the over the last 12 years of trading. We offer free delivery on customers with in the UK, EU and the USA. Fit an Eddy electronic descalers to reduce hard water problems, contact us now for more details.